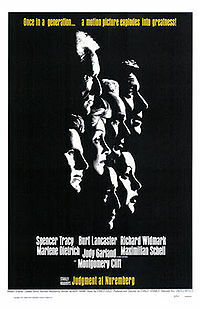 Judgment at Nuremberg (1961) is a fictionalized film account of the post-World War II Nuremberg Trials, written by Abby Mann and directed by Stanley Kramer, starring Spencer Tracy, Burt Lancaster, Richard Widmark, Marlene Dietrich, Maximilian Schell, Judy Garland, Montgomery Clift, Werner Klemperer, and William Shatner. Originally written for television, the film depicts the trial of certain judges who executed Nazi law. Such a trial did occur: the film was inspired by the Judges' Trial before the U.S. Nuremberg Military Tribunal in 1947. By the time the film was made, all of the convicts had already been released, including four of them who were sentenced to life in prison. A key thread in the film's plot involves a "race defilement" trial known as the "Feldenstein case". In this fictionalized case, based on the real life Katzenberger Trial, an elderly Jewish man was tried for an improper relationship with an "Aryan" woman, and put to death in 1942.